Egregious DRM and poor matchmaking mar an otherwise surprisingly fun and accessible multiplayer shooter. Imagine if Christopher Nolan walked into the office of Geoff Warner and told him the next movie he wanted to make was 'The Dark Knight On Rollerskates'. He'd be laughed out of the office. There's a formula for making a movie blockbuster. Games are different. In the world of games, it's entirely possible for someone to walk into an important person's office, pitch 'Batman on rollerskates' and walk out with a signed contract. Gotham City Impostors is the result this pitch. You play one of a team of plucky wannabe Batman or Jokers, given a stack of ridiculous weapons, tools and gadgets and charged with annihilating the other team in creative and violent ways. The core of Impostors is a well-executed Modern Warfare clone, and the weapons are as weighty and satisfying as that implies. Floating damage numbers means there's good visual feedback as to what harm your shots are doing, and the more unusual weapons tend to have big colourful effects so you can easily tell what's going on. Killing players and accomplishing objectives earns you XP, which levels you up, unlocking different weapons and abilities. The joy is in the insanity slathered on top. Each player gets a 'gadget'. You start out with a grappling hook, and you can unlock the aforementioned rollerskates, spring-boots, smokebombs and – best of all – a hang-glider that lets you divebomb enemies from the air. The unlocking system is elegant: you earn unlocks with your levels, then spend them on whatever you want. So you can get a rocket launcher almost at once, and get rid of the opposition's pesky Batman without hours of dark symbolism and police station interrogations. Five maps are provided, and each of the three game modes fits comfortably inside them. Team deathmatch is as fast-paced and brutal as you'd expect, and a capturethe- battery mode is good fun, but it's the variation on command points that's the most enjoyable. You battle over a series of machines that pump noxious gases into the air, and the team that can successfully pump the most gas into the sky asphyxiates the other side. It's the first multiplayer shooter I've seen that's influenced by Boyle's law of gas pressures. It wouldn't be an online shooter without hats, and there are stacks of them, together with shirts, scarves, facepaint, pants and all sorts of other sartorial choices that you can pick from by spending 'costume points' that are earned while playing. Between that and a choice of body sizes, voices and 'calling cards' displayed when you kill someone, there's plenty of room to make your character your own. There are only two things wrong with Gotham City Impostors. First, copy protection: it uses Steam, Games for Windows Live and a proprietary Warner Bros ID system. Thankfully the latter is optional, but the inclusion of GfWL in 2012 is pretty much unforgivable. The other problem is in the matchmaking, which is about as basic as it gets. You pick a game mode and it puts you in a game. That's it. No choice of servers, no ability to join games in-progress (a patch for that is promised) and no way to keep track of players between games. 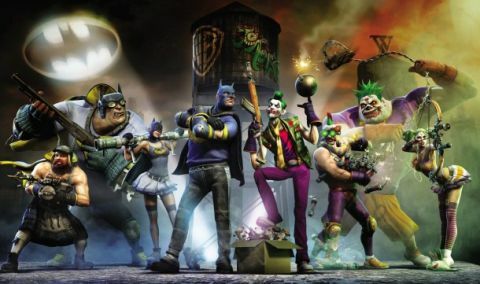 In short, there's little way for a community to form around the game – and unless that's rectified, then there's little long-term hope for Gotham City Imposters. Which is a shame, because it's fun.